I remember a time when I used to try to carry fresh bread on the trail and it was not always worth the effort. Traditional sliced bread gets squished pretty badly in a backpack which, while great for making French toast, just isn’t appealing as a side to my favorite soup or on a sandwich. The problem is that fresh bread can get mould on it pretty quickly, especially in humid conditions and if it doesn’t get the blue-green fuzzies then you have to deal with it becoming stale. I’ve found that the same rings true with Greek pitas and other soft flatbread. The only of the softer bread-like items that seem to have a long shelf-life are tortillas. 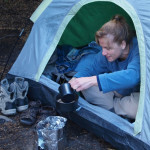 We often like to nosh on soups and stews and on the eighth day of a wilderness trip it really nice to have a side of something fresh and bread-like. 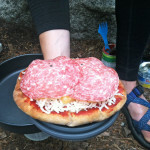 With a backpacking oven I can make all sorts of items such as pizza, focaccia, muffins, rolls, and biscuits. But what if you don’t have a backpacking oven? 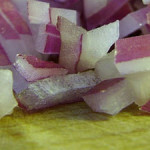 Here are two recipes from my books that can be easily made in a pot or frying pan. 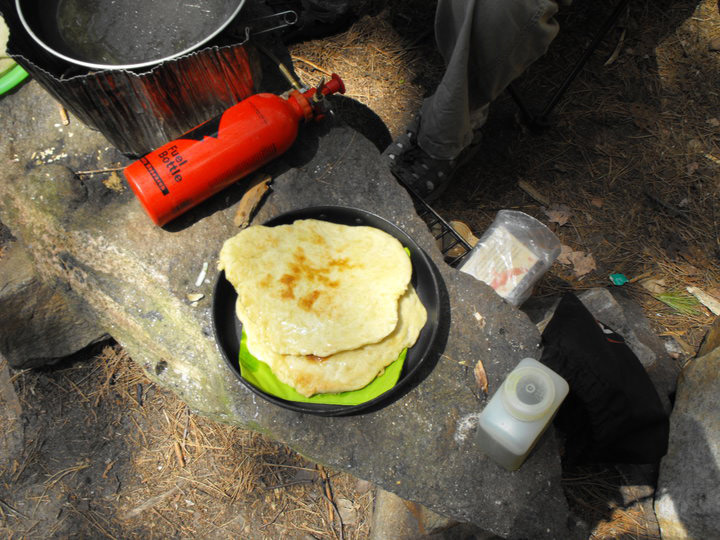 The bannock recipe can even be made over a campfire. Many believe that bannock bread originated with Native cultures, but it was the Scottish who brought this bread to North America. 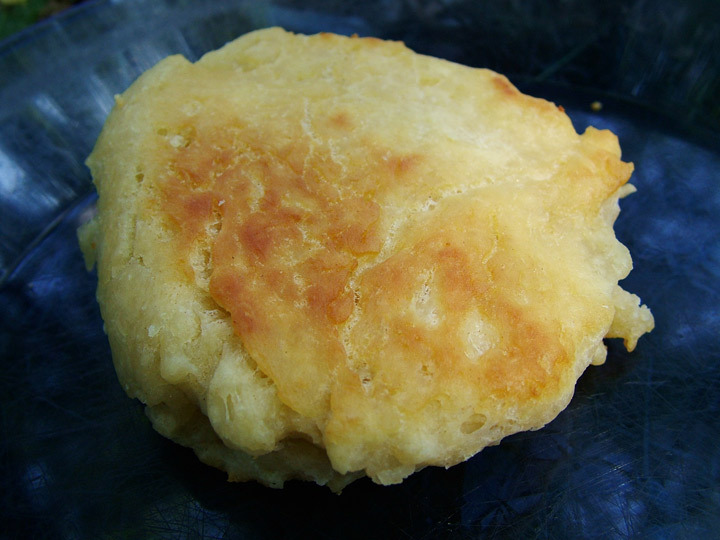 Traditionally, bannock is baked on a stick, but it also cooks well in a frying pan. Mix the dry ingredients, and pour them in a ziplock freezer bag. Add the oil to the other vegetable oil that you are taking on your trip. Add enough cold water to the bannock mix to make sticky dough. Cook the dough in a frying pan. When the bottom is golden, flip the bannock to cook the top. If your pan is smaller than 9 inches in diameter, divide the dough in half and cook half at a time You want the bannock to be about 1/2 inch thick before cooking. Allow to cool. Wrap any leftovers in parchment paper, and store them in a ziplock freezer bag. Bannock is good to dip in soups or stews and also makes great sandwiches. Add a tablespoon of sugar and dried fruit to the dry ingredients for a sweet bannock. Add roasted garlic powder to some butter and use the bannock as a base for garlic bread. If you prefer to use whole wheat flour you can replace half of the all-purpose flour with all-purpose whole wheat flour. This bread is delicious when sprinkled with a little spice blend called za’atar. Place the flour except for the additional 1/4 cup in a large ziplock freezer bag with the unopened envelope of yeast. Wrap the 1/4 cup extra flour and sugar separately in plastic wrap and the salt in a medium ziplock bag that has been labeled. Place the flour, sugar, and salt packages in the bag with the large amount of flour. Pack the oil with the other oil you will take with you on your trip. Put 1/2 cup warm water in your cup and mix in 1 teaspoon of sugar. Sprinkle the rapid-rise yeast into the water, and let it sit for five minutes. Meanwhile add 1/2 cup warm water to the freezer bag containing the salt. Remove the extra flour bundle from the large bag of flour and set aside. When the yeast is activated pour the mixture, along with the salt water mixture, into the large bag with the flour. Knead the bag for 8–10 minutes, adding more flour if needed. 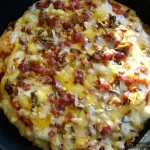 Divide the dough into 6 pieces and flatten each piece into a 1/4-inch thick circle. Heat a little of the oil in a frying pan over medium heat and fry each flatbread, flipping once, until golden brown on both sides. Both of these make for handy base recipes. The bannock is delicious with a little rhubarb and strawberries that were made at home, dehydrated, and then reconstituted at camp. It’s also great alongside your morning eggs or your favorite soup or stew. Sometimes we have bannock for lunch with some cheese and shelf-stable sausage. When we do this we make the bannock at breakfast or even the night before. We have a friend who makes this for dessert but stuffs it with caramel and apples. The flatbread is easy to make. It is delicious as an accompaniment to trail salads and dinners like Moroccan Chickpea Stew from my first book. Leftover flatbread can be use the next day for lunch with your favorite hummus or spread. Really, the only limits are your imagination.